Maximum Achievement is one of the best personal development books in the world. The author, Brian Tracy, is also one of my favourite authors in the personal development industry. His books are easy to read and easy to digest. He has a way with words that makes it easily accessible and interesting to read his insights. 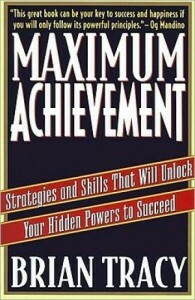 Maximum Achievement is his best selling book among the forty he has written and the one all readers strongly recommend. Maximum Achievement is a comprehensive guide to success covering everything from the laws of success too parenting. Below I have given a short overview of each chapter and their contents. The Laws of Success – For example the law of control, the law of cause and effect, the law of belief, the law of expectations, the law of attraction, the law of correspondence, the law of mental equivalency and many more scattered throughout the book. Your Master Program – How your mind controls everything and if you feed it the right messages (program) it will set you on the course to success. The Master Mind – Pushing knowledge into the subconscious and getting your mental computer to work 24 hours/day on your goals. The Master Skill – In this chapter Brian shares his views on goal setting, my article “How to set goals that will make you rich” is closely related to Brian’s views on this subject, he discusses how you need clarity to your goals, putting them on paper in the positive present tense and the importance of deadlines. The Master Power – The superconscious mind, what the psychologist Carl Jung calls the collective unconscious, this is something you might or might not believe in, but the examples in the chapter are interesting all the same, it is a chapter worth reading, if nothing else for the insights you might receive. The Master Decision – The most important part of success is understanding and accepting that it is completely up to you. If you succeed it is thanks to you, if you do not, it is your fault. This is hard for many to accept, that everything that has happened to them up to this point is because of decisions they have made. The Master Goal – Your highest goal must be happiness, clarity and the ability to relax and love yourself and others. This will open the doors for all other successes. But putting this ahead of everything else is difficult and short term gains can often lure us to not put our happiness first, but if we don’t, all our other relationships and opportunities will deteriorate in the long run. Human Relationships – Your relationships with others are what will mark your successes and your failures. By learning to be a better listener, conversationalist and person, you will quickly improve your chances of success. Personal Relationships – The difference between friendship and loving relationships is how much you are together and how dependent your are on each other. You need to master personal relationships to be able to truly become a complete person. The Art of Parenting – The most important endeavour we ever undertake is parenthood, I have not yet myself but it is what I consider the most important thing I will ever do, if I fail all else that is what I hope to accomplish. What you do as a parent will affect your children, their children and the children of generations to come. Love – You aren’t complete without love. You need to love yourself to love others and you need to feel love to be able to function. This is probably the most important part of your life, do not do it half heartily. I really like that Brian Tracy freely shares credit where credit is due. Whenever he takes an idea or principal from someone else (even if they could be considered a competitor) he says so, he writes “As X says in his book Y …” This shows great character and that he himself practices what he preaches. I have followed Brian’s teachings for a long time and I have always had great results with his techniques. This time was no difference. Simple tips to focus, such as “the quick affirmation technique” – you close your eyes, visualize the result you are hoping for, load it with emotions and then release it – has helped me improve my confidence before a meeting and have helped me become a more skilled salesman and coach. He repeats himself a lot! The reason the book is 350 pages instead of 280 is because he repeats himself constantly. This helps you remember it but once in a while it feels as though he copied one paragraph and put it in 4 different places. All the advice might not be suited especially to you and since Brian Tracy is a very religious man there are some parts that you might not be interested in following, if you aren’t religious yourself, if so, skip those parts and move on to the advice that makes sense to you and will help you succeed. Brian Tracy gives a complete guide to success in Maximum Achievement. If you are looking for a shorter guide to riches and fame I recommend you read “Think and Grow Rich” By Napoleon Hill instead. The tips and advice given in the book more than warrants the 10 dollars + shipping that is asked for. If you implement only a few of the techniques you can double, triple and even quadruple your income. What is great is that most of the advice can be used at once, you can start to use the techniques today and already tomorrow you will start to see a difference. If you are looking to quickly put your career on the fast track, are willing to work hard to succeed, willing to believe in the laws that determine success and start thinking about your overall goals and dreams you are in the right place for this book. It will help you go from where you are today to where you want to go, faster than you can even imagine.